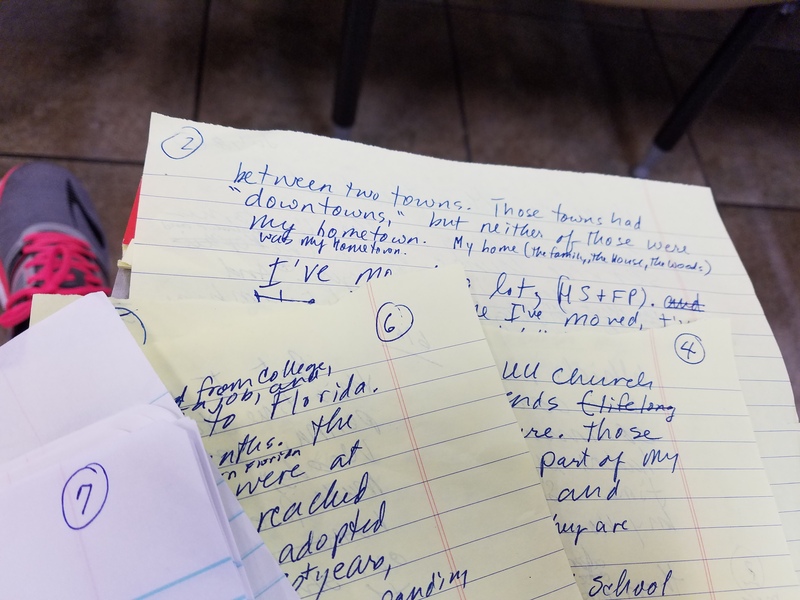 I’m sitting in a waiting room with time on my hands so I’m drafting my next blog post by hand. On paper. Long hand. I’ve written six pages so far, I’m starting on page 7, and in some ways, I’m not even STARTED. It’s a sprawling theme, something I have been chewing on actively, for three weeks, but which I now realize I’ve been thinking about my whole life: home. What is home, how do you define home, what makes a home, home? Honorable Shamans and Fellow Pagans, your sense of home defines you, and has a lot to do with how you see yourself in your Spiritual life. Before I set out on my journey South by Southeast this weekend, to visit friends, attend ceremony, and go swimming in the Atlantic Ocean, my very good friend cautioned me to be careful swimming, because, “There be Dragons… And Rip Tides.” I laughed with him nervously about the Dragons, and assured him I know what to do about Rip Tides. So I set out on my road trip, covering 100 miles on Friday, arriving at my friend’s house, after some mild excitement on the way down. Next morning, I overslept my alarm, so I missed the 8:00 am water blessing ceremony. I eventually completed the last 50 miles at about 10:30 am, arriving in the town with absolutely no idea where to find the Water Tribe, having only a list of four parking lots in my memory. Ok. I drove east until I had to go left or right. I went right. I drove a few blicks, and saw one of the named parking lots, pulled in and got the last space. Got out of my car and realized I know the woman walking towards me. She’s a member if my UU Church from Fort Myers, a member of the Water Tribe. Synchronicity! She told me where to find the rest of the Water Tribe. I headed over to the Beach. As I reached the crest of the Dunes, I immediately began scanning the surf, to gauge the shape of the waves, and how they were breaking and running. I grew up going to the New Jersey Shore, and learned all about Rip Tides there. I was satisfied the current would be safe, and proceeded to the water’s edge. I greeted my fellow Water Tribe, peeled off my mumu, put all my stuff in a pile, blew kisses to everyone, and strode into the Ocean. 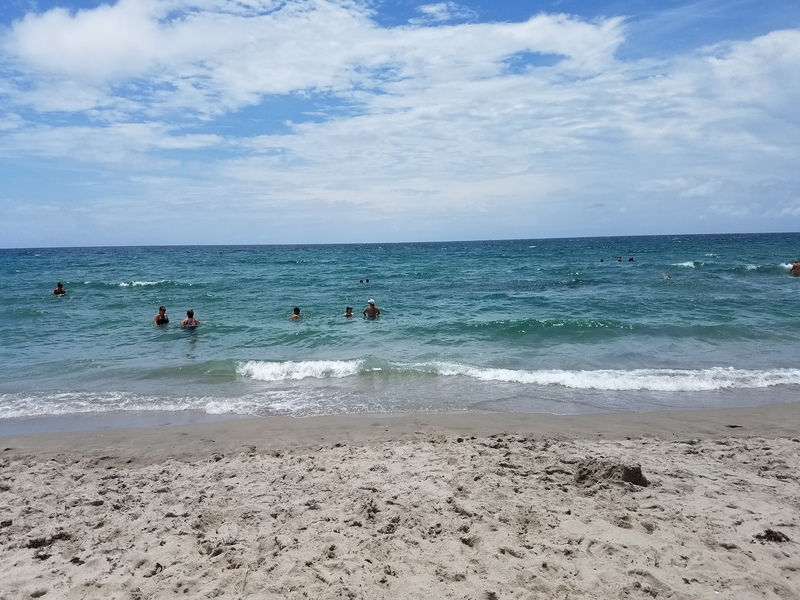 The waves were running about 18 inches high, which is hardly worth jumping, but it’s better than the Gulf which is like the World’s Biggest bathtub. There, the waves are maybe 5 inches high. On the other hand, there was a fairly strong tow to the North, but not an undertow. I had to swim back to my mark on the beach, frequently. Time slowed down, and I relaxed, and enjoyed the waves, the water, the sand under foot. I practiced my wave jumping form. I stretched my legs, I did slow spins, and corkscrew spins. These are all the things you would expect a Pisces Whale Person to do at the beach. I stood still and the critter did not advance. Good. I backed up about 5 feet, going parallel to the beach and the critter did not advance. Good. Then I turned to the beach and moved 5 feet in, toward the beach. The critter stayed put. EXCELLENT. By then, I calmly skipped out of the water, and LOOKED back to the surf. The critter was where I left it. Great. I think it was a pair of large sting rays. No pictures of them. I’m glad I didn’t accidentally step on them! Share your Peace with Mother Earth and Father Sky and the Big Waters all around us. Remember, when you are swimming in the Ocean, you are in someone’s living room. The day after I saw the armadillo crossing the road, I saw a Turtle crossing the road. When I saw the armadillo I was traveling at about 25 mph and it was most of the way out of the road by the time I crossed its path. When I saw the Turtle I was traveling at about 50-60 mph and had to swerve to avoid hitting it. And the turtle was traveling East. In my symbology, East relates to what has passed, memories. All I have to do now is remember what I was thinking about at the time. This was last Thursday and so much happens. (October 15 update.) 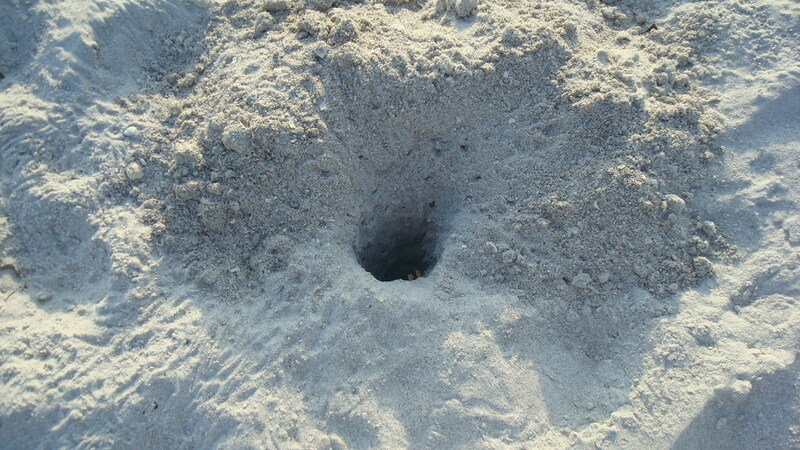 Here is the photo of the turtle nest, with what looks likeanimal tracks around the hole. I have this photo in another post, but I thought I’d put it here with the Turtle topic. There are rain droplets surrounding the opening to the nest and underneath the raindrops, there are animal tracks. They may be turtle toes, but they may also be bird tracks. 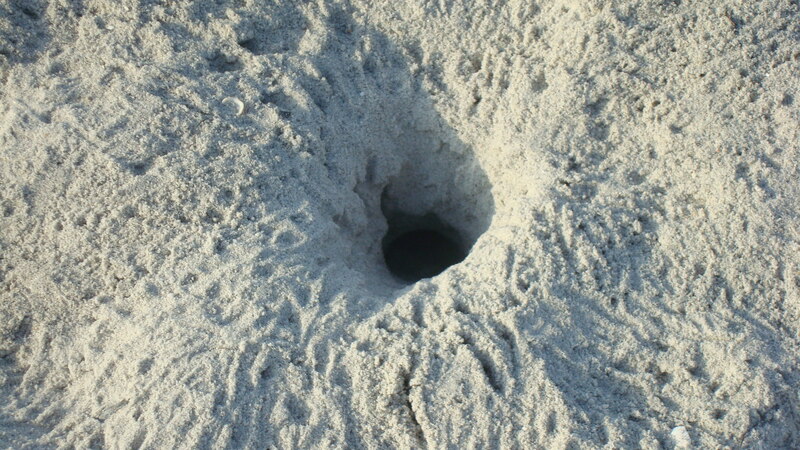 This is a hole made by an animal, not an animal hole. This is one of several turtle nests that I saw on Captiva Island this summer. What: Ostego Bay Oil Spill Co-op Hazardous Material Technician Oil Spill First Responder Certification Class. When: June 15, 16 and 17, eight hours each day. Where: Ostego Bay Foundation 718 Fisherman’s Wharf, Fort Myers Beach. Contact: Joanne Semmer, 765-8101 or info@ostegobay.org. For more information, see info@ostegobay.org. Being Proactive about the Gulf Oil Spill. Ok, after we wring our hands about the Gulf Oil Spill, what can regular people do to help? 1. Contact your barber or salon to see if they are donating hair clippings to the cleanup. If so, go get your hair cut! I had my hair cut today and while they were sweeping it up one of the ladies mentioned that my hair was now joining the Clean up efforts. 2. Voulnteer to assist in cleanup efforts. 3. Donate clean up supplies, if your community requests it. Communities have identified stretches of beaches to protect. Communities are preparing to pick up tar balls, and to address the oil on the surface of the water. Citizens will be asked to help pick up tar balls. In some communities, volunteers will be provided with rubber gloves and trash bags. Communities will place booms in the water to help prevent the oil from reaching the shoreline. The booms only cover so much shoreline. Check your local newspapers for more information about clean up efforts. Author Whale MaidenPosted on June 12, 2010 June 12, 2010 Categories The BeachTags booms, BP, Cleanup efforts, Gulf Oil Spill, hair clippings, tar ballsLeave a comment on Being Proactive about the Gulf Oil Spill. In which the Crow has a snack. When I was out at Sanibel Island last Saturday, I saw a Crow having a bite to eat. I didn’t realize Crows eat Bivalves! Be sure to look at Photo #4 carefully to see the Crow clutching the seashell in its talons. Last Saturday, I had the opportunity to go out to Sanibel Island for the morning. My Daughter, Agatha, had a school assignment out there and I went along for the ride. It was sunny, but windy and cold! I was also surprised at how foggy it was. So of course, the first thing I look at when I am at the Beach, are the Waves in the Gulf of Mexico. (*) And then, I look left and right. Then, I look down at the Beach itself. I saw an “earth circle,” which is what I call a natural formation that makes a circle. (A Medicine Wheel.) This one is made of a spindy vine of some kind. I saw a nice Pen Shell. Note the air holes in the sand next to it. Those may be from sand crabs. The purple pointy object, is a small Sea Urchin. It was smaller than a golf ball. The last photo (with the snake looking object,) is a Welk Egg Case. (*) You must keep in mind that the Beach is on the Gulf of Mexico which is to the West. I’ve been here in Southwest Florida for almost 30 years. However, I spent my formative summers at the Shore, which faces EAST. So, anytime I am orienting myself even to this day, I have to consciously think about where I am.